Hi all! This is sort of a psa post. The fact is, I've not been posting here much at all lately. The current project I've been at for a few months now has taken new roads, following new adventures. Consequently, posting here has taken a nose-dive. I'm still very active in the game. Perhaps more than ever and that's saying a lot. 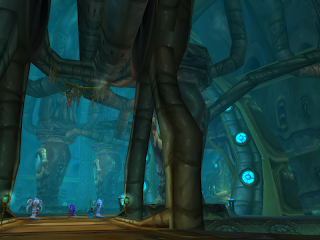 The Horde Project is on a different server than Sol and all his alliance kids. It has become the new 'home base', so to speak. 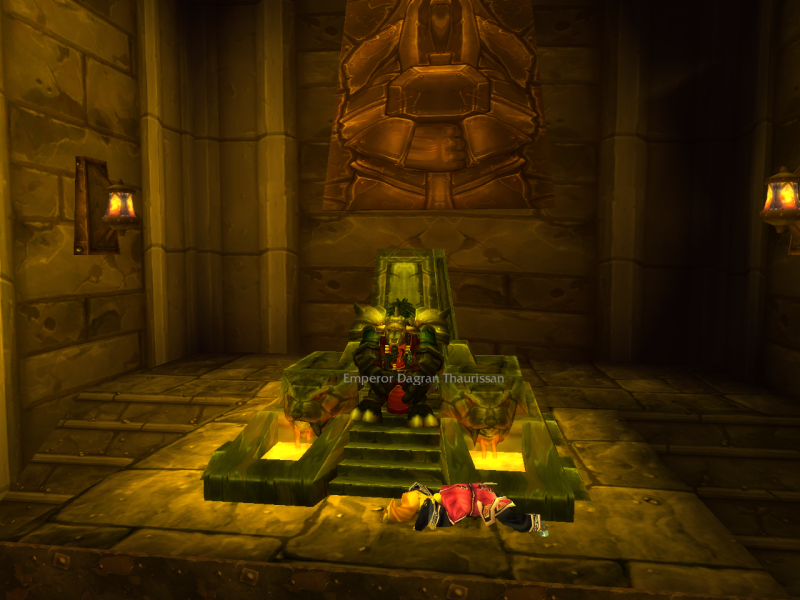 That's Aygaren. 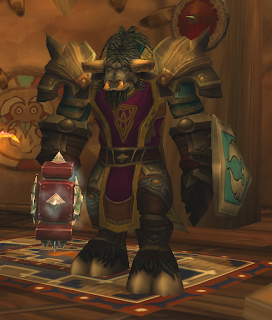 He's showing off the new tabard. lol, he even got a haircut and style so it would show better. 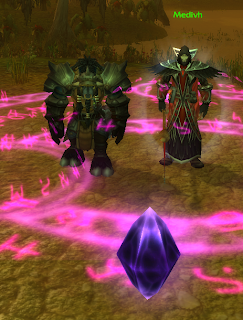 Aygaren and his adventuring friend decided to start a guild together. It's a joint venture. It also requires a lot of time investment. Hence, the reason for posting around here drying up to the shape it's in. 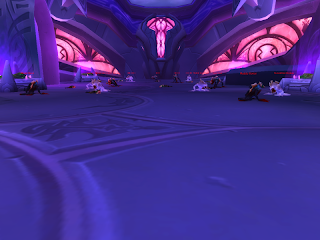 I'm not sure what's going to happen to Moonkin Journeys just yet. Haven't made any decisions one way or another. I did wish readers and followers to know that there won't be any posts here for an undetermined amount of time. Things are really hectic on the home front today. The computer with game on it decided to take another vacation, maybe permanately. Anyway, I'm doing a fresh install on a temporary laptop set-up mixed with desktop monitor-keyboard and mouse. Sould prove interesting if everything finally gets downloaded with the game. In the meantime, I dealing with slight depressions over possibly losing all my screenshots and other associated game/blog files, which I obviously never took the time to back up on disk. Time will tell though, and we'll move on as best we can. We'll be returning to posting in near future, hopefully with interesting stuffs for a change--lol! Yes, I've been really slack around here, once again! Not totally without good reason though. Aygaren has gone a bit off his usually calm approach to things lately. 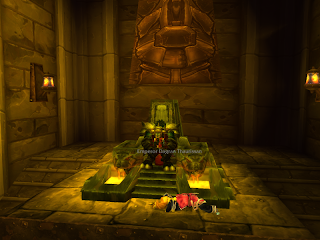 I think it had something to do with his stress over not jumping into the dungeon finder. 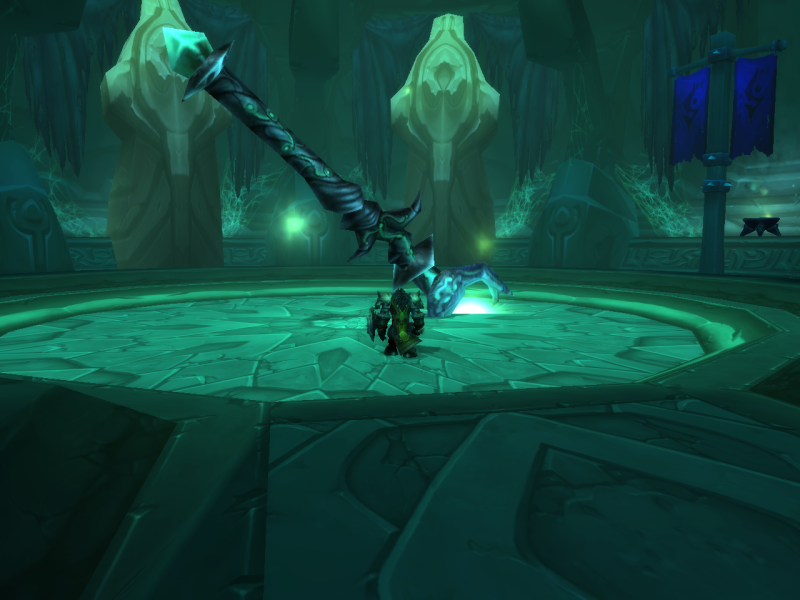 Not wishing to be left out of everything, he's been on a rampage soloing Classic and Burning Crusade dungeons. 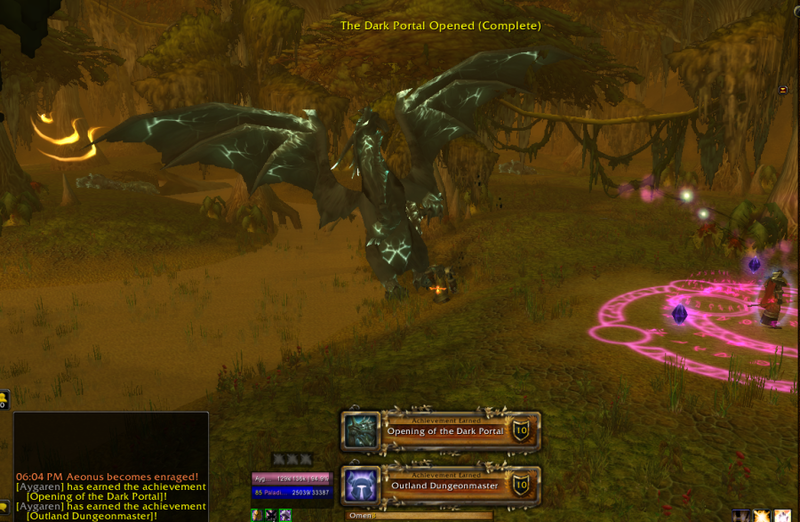 Along with doing his obligatory Firelands dailys with a mix of Tol Barad dailys. Toss in a couple of battleground appearances and you'll get a picture of his strange actions. He's had quite a romp through Outland though and enjoyed every moment of it. Who could ever forget Murmer's Staff? Everything proved to be very interesting to do and the sights from places he's never been were amazing. Hopefully, all this running about will prepare him better for the Cata instances, which he would like to try with groups alongside. 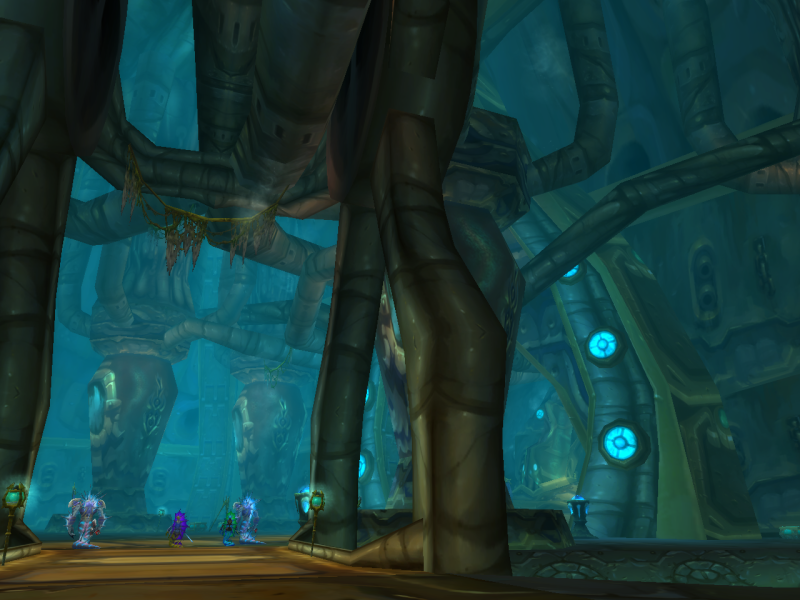 His rampage through these dungeons though has also been duly noted in his records. 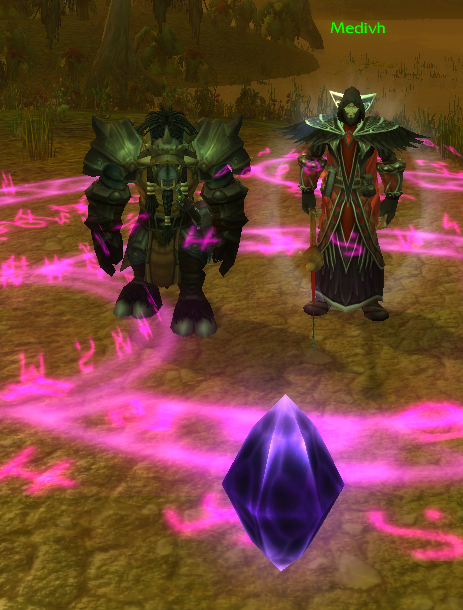 On a side note, Aygaren actually did one of those transmogging thingys this past week. He was wearing/using this Twilight Mirrorshield he obtained from a quest. Pretty good shield he says. But kind of not so good looking. 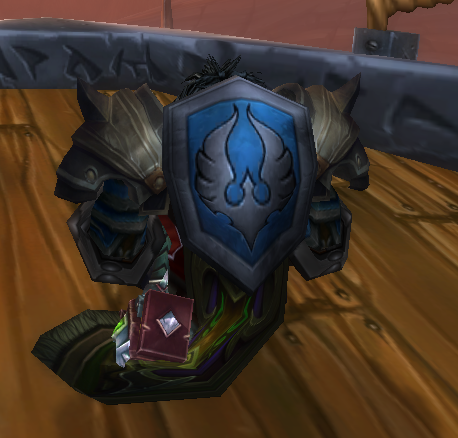 During one of his many dungeon runs this past week he happened to come up with the Silvermoon Crest Shield. He really liked the looks of it so much better that he spent the 14 gold and some silver pieces to change the look. Just sooo much better looking now! I worry about Ay though. 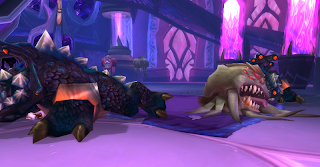 Now that he's found those transmogging folks in Org, he may just be changing his whole appearance. So, that is what's been happening the past week or so. Ay has been taking his Fenris "main" position to heart and setting examples for the rest of the crew. I hear that Dufit has been expressing some concerns over all this. Rumor has it that he wants to better Ay in several ways, lol. 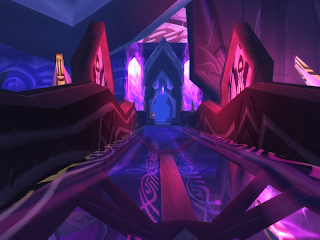 And rumor has it also that Ay has set sights on Northrend dungeons now. My o' my. Where will it all end up?